Using powerful mathematical techniques from information theory, linear systems theory, convex optimization, and functional analysis, a professor of electrical and computer engineering at the University of California, San Diego resolved a 40-year-old open problem in the field of communication. 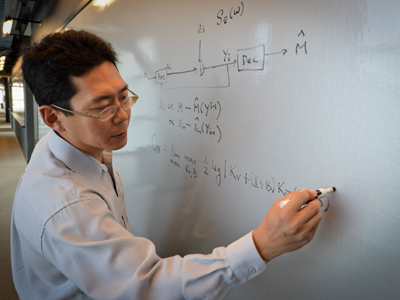 Professor Young-Han Kim tackled the problem in a paper titled, “Feedback capacity of stationary Gaussian channels,” which has now received the 2012 Information Theory Paper Award, one of the highest honors in the field of communication theory, awarded each year by the IEEE Information Theory Society. The award recognizes exceptional publications in the field of information theory that appeared in the preceding two calendar years. Kim’s paper first appeared in IEEE Transactions on Information Theory in January 2010. In the paper, Kim characterized the maximum throughput, or ‘capacity’, of the Gaussian channel – the canonical model for both wired and wireless communication – thus establishing the optimality of such linear feedback communication. Communication systems, in which one ‘controls’ another’s state of knowledge, are notable exceptions. By encoding data with a forward error-correcting code in long blocks, one can communicate reliably over a noisy channel without any interaction between the sender and the receiver. Nevertheless, most communication systems are built over inherently two-way channels, such as telephone lines and the Internet. Kim’s paper focused exclusively on the Gaussian channel. As in everyday conversations, feedback allows the sender (speaker) to iteratively refine the receiver’s (listener’s) knowledge about the intended message. By learning what the receiver knows at the moment through feedback, the sender can fill in the receiver’s error, the error of the error, the error of the error of the error, and so on. So should the Internet be redesigned with simple linear feedback signaling? The UC San Diego researcher is less certain. Nevertheless, Kim argues that the Internet’s popular transmission control protocol (TCP) can be viewed as another instance of iterative refinement, in which the receiver requests missing packets from the sender. 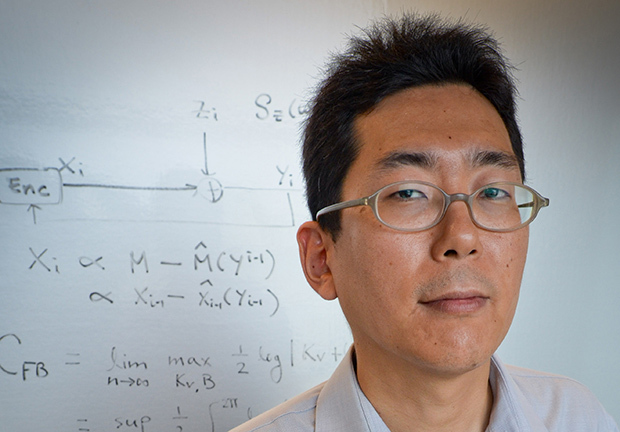 Kim’s research interests also include statistical inference, learning theory, and quantum information processing. Young-Han Kim earned his Ph.D. in Electrical Engineering from Stanford University in 2006. After receiving B.S. degree with honors in Electrical Engineering from Seoul National University in 1996, Kim spent three-and-half years as a software architect the Seoul-based company Tong Yang Systems, then worked on several industry projects – including development of the communication infrastructure for the new Incheon International Airport – before resuming graduate studies at Stanford. Kim received a 2008 NSF Faculty Early Career Development (CAREER) Award and the 2009 US-Israel Binational Science Foundation Bergmann Memorial Award. He serves on the Editorial Board of the IEEE Transactions on Information Theory as an Associate Editor for Shannon Theory. He is also a Distinguished Lecturer for the IEEE Information Theory Society. *Young-Han Kim, “Feedback Capacity of Stationary Gaussian Channels,” IEEE Transactions on Information Theory, Vol. 56, pps. 57-85, Issue 1, January 2010.